What's so great about Seattle? So, I have these friends who are bi-coastal, living part of the time in Boston and the other part in Seattle, and they invited me to visit them in their new home. Finally, I went. It has been achance to visit with good friends and answer the nagging question, What's so great about Seattle? Now, after spending a few days in the city, I think I have an answer...just about everything. Let's start with the obvious, Seattle is quite possibly the city of coffee, maybe it has someth to do with all of that rain. 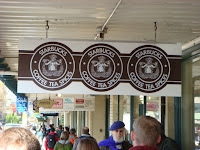 In 1971, a little shop opened in Pike's Place Market specializing in quality coffee beans. Thirteen years later, that same little company decided to bring the Italian espresso bar culture to Seattle, serving their first cafe latte. Thirty-five years later, that one little coffee house now spands the globe with more than 12,000 shops. For me, Seattle was a pilgrimage to the very first Starbucks, and though they are the best known of Seattle's java purveyors, they are by no means the only.ing Whether from small local chains like Cafe Ladro, specializing in fair trade, organic, shade grown coffee, to the tiny shops like Cafe Bambino, there is always a good cup o' joe for the asking. While sipping your latte, there is pleanty of art and culture to contemplate. Though there are literally dozens of indivdual galleries with everything from Old Masters to contemporary to glass, it is Seattle's monumental art that lends such a cosmopolitan air to the city. Though the Space Needle may be the best known of Seattle architecture, this city of 3,000,000 has not one but buildings by two of today's best international architects. The Experience Music Project, the museum of music funded by Mircrosoft co-founder Paul Allen, resides in a building designed by Frank Gehry. Like all of his designs, the EMP is a collection of curves without a single flat plane. Though much maligned, its bright colors and bizarre design are breathtaking. 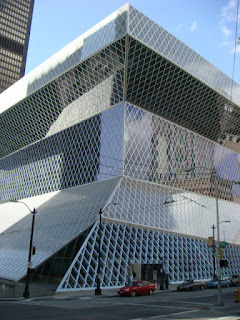 Even more impressive than Gehry's creation is that of Rem Koolhaas, Seattle's Public Library. This glass and steel immensity, a collection of odd angles and criss-crossed steel girders, is in some ways the very opposite of Ghery's EMP. Most impressive about the Public Library is that it was publicly funded. Seattlites' willingness to assume the cost of a major architectural feat such as Koolhaas' is an example to be followed by every city that wishes to be great. 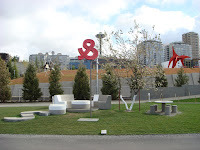 New this year to the Seattle art scene is the Seattle Art Museum's Olympic Sculpture Park. Situated at the edge of Puget Sound, this nine-acre industrial space was on the verge of being sold to a developer to be filled with more upscale condos (just what every city needs) until a concerted effort was made to preserve the last undeveloped waterfront property. With the help of wealthy donors who ensured the park's operational budget, making the park open to the public, the waterfront was preserved, giving Seattle residents a place to experience the beauty of art and nature in a single place. 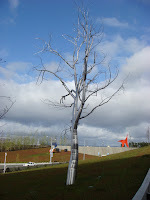 Filled with an array of sculptures from the sublime to the ridiculous, the Olympic Sculpture Park is a huge success. "Love and Loss" by Roy McMakin and "Split" by Roxy Paine are probably my favorite pieces. The first is a three-dimensional collage including poured concrete benches and pathways, a living tree, a table, and a neon, rotating ampersand. The use of language and objects, both living and inanimate, forces the viewer to contemplate what love and loss means in the rhythms of our life and the rhythms of nature. "Split" is a stainless steel tree that begs the question of the relationship between art and nature. Seattle is a city of food and wine second to none. 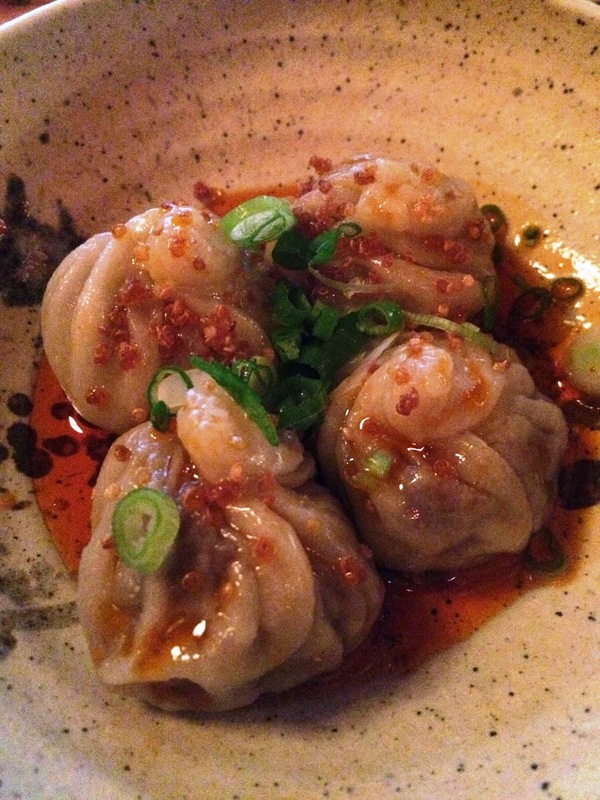 With nationally recognized chefs like Tom Douglas (a Seattle force of nature with six restaurants and a catering business), it is easy to fi nd something fabulous to nosh. Focused on quality ingredients from the Pacific Northwest and innovative preparations, my two favorite places were the Steelhead Diner and The Brooklyn. At the Steelhead Diner I started with a caviar pie that was decadent in the extreme. With cheese, hard-boiled eggs, and three different roe, it was the perfect way to start. Though there were too many goods things to choose for an entree, the ivory King Salmon (an albino fish with a slightly sweeter flavor) was perfect. 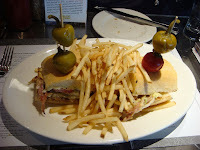 Everything was so good, I went back for lunch two days later for the dungeness crab cake (beautiful chunks of meat, no filler) and a slow cooked pork sandwich served with flawless frites, crunchy on the outside, tender on the inside, and perfectly salty, no condiments needed. 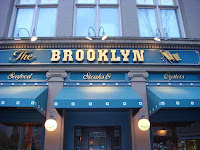 The Brooklyn is a steak house from the old days, with expert service and a kitchen staff that cares deeply about providing a great meal. I had a steak au poivre the first night and an Alaskan halibut in a meyer lemon burre blanc the second night. both were prepared to perfection. Even better than the entrees, though, were the oysters, a specialty of the house. These Northwest beauties ranged in flavor from subtle melon (Miradas) to balanced and briny (Penn Cove) to sharp and metallic (Deep Bay Flats). For the oyster and steak lover, The Brooklyn is where to go in Seattle. Wherever you eat in Seattle, you are bound to find a wine list filled with Washington wines, and they are worth sampling. A city should have something for everyone says a friend. By that definition, Seattle is a not just a city but a great city. It has art and architecture, food and wine, and I didn't even mention music. What more could you ask for?